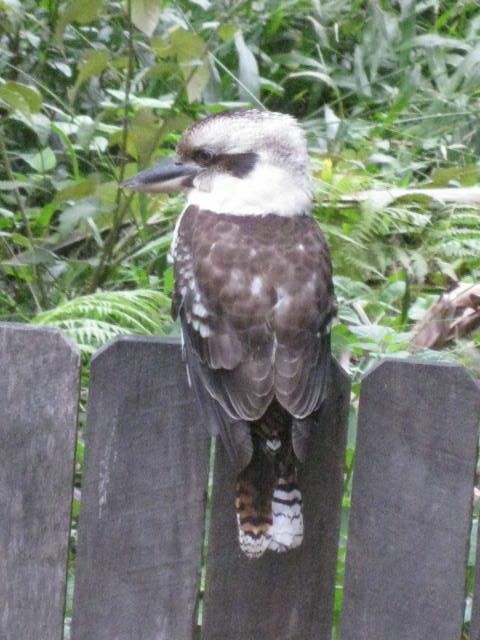 I was rather taken aback recently when visitors from both Finland and Holland who'd come to stay with us here in our shack in the bush separately declared that they hadn't ever heard of such a thing as a kookaburra. How could this be? 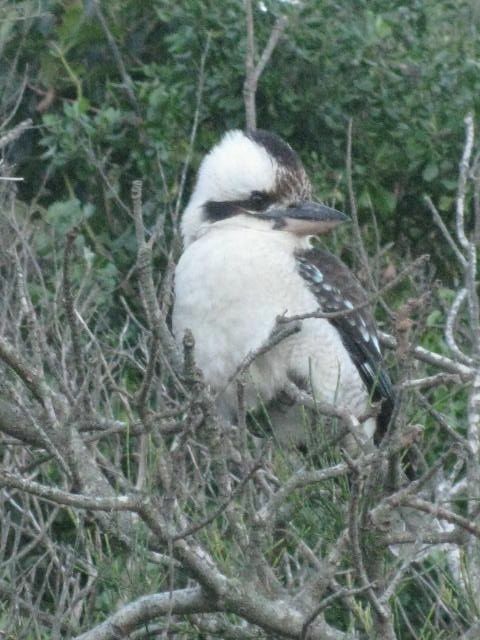 The kookaburra is an Australian icon. And of course there's that song...surely everyone knows the song?! As a family we used to sing Kookaburra sits in the old gum tree to relieve the boredom of long car journeys, often as a four-part round. Consequently the song has been part of my musical make-up forever, along with similar stalwarts Green grow the rushes, oh and Ten green bottles sitting on a wall. I remember it being a Cubs favourite too (although fortunately I have successfully managed to block out most of my memories of going to the Cubs). Living in St. Albans, we all knew then what a kookaburra was, what they looked like and what they sounded like, despite the fact we weren't ever going to see one making its merry way down Sandpit Lane. Gay your life must be!" I was very excited to see my first kookaburra back in the 70s on my initial trip to Australia and even more excited when I first heard them. After all, they're not called Laughing Kookaburras for nothing. Theirs is a delightful and utterly unique song. It usually begins quietly, gurgling a little, before building up into a raucous, infectious cackle. Once in full flow an individual's song invariably induces another kookaburra to join in, and then another, until the air is resounding with a diabolic mocking chorus. Whenever we sat down to picnic in a clearing in a National Park on our campervan trips, a kookaburra or two would be eying us from the trees above the picnic table waiting for a morsel of food to drop to the floor which they would swoop down on and carry off. Even now, seeing Laughing Kookaburras almost daily as I do, I still get very excited by them. They seem so quintessentially other (and the other is what I want from foreign places). The name itself is suitably exotic, part of another language, another culture, another past. And although they are supposedly related to kingfishers seeing one is like seeing a kingfisher through Alice's Looking Glass: every part is recognisable but they're all slightly skew-whiff. The beak is overlarge, the eyes set too deeply in a furrow of feathers, they suffer from gigantism, their tails too stubby, the flash of blue wing too surprising. Decidedly odd. And that's before they've even opened their mouths to let rip with that ludicrous song. Here in Greenwich they start their singing at about 5.30 in the morning which, if you're a light sleeper, is rather wearying. As I mentioned earlier, once one has led off a whole bunch of them tend to join in with their own comments. Fortunately they don't call out to each other for long, you hear them in concentrated bursts only. Once they have their dawn chorus out of the way they tend to be silent for most of the rest of the day, piping up again only when dusk begins to fall and then they are at their noisiest. If you do hear them during the day its usually because they are setting up some kind of alarm system to warn of approaching danger. To return to that song again. Since we moved to Sydney it has been in the news a fair bit, in fact it's been to court. Perhaps you remember Men at Work's Down Under, an extremely irritating song that topped the charts all over the world (including the UK and the USA - a first for an Australian band)? Men At Work quite blatantly used a riff stolen from Kookaburra sits in the old gum tree which was written by a Melbourne music teacher back in 1932 (she was called Marion Sinclair and she donated her own rights to the Girl Guides). Although the composer is now dead, a publisher sued Men At Work for backdated royalties in 2009. The case went on and on. Was the riff stolen, was it not? (yes, it was decided, they'd stolen the riff). Who owned the rights, who didn't? (the rights belonged not to the Girl Guides but to the publisher, Larrikin Music, who'd bought them for a song (!) in 1990). Who in Men At Work actually stole the riff? (who frankly cares, the song was a crime!). Men At Work eventually lost the case and had to give back 5 per cent of all royalties on the song backdated to 2002 (a six figure sum - so imagine what they made between 1983 when it was No. 1 everywhere and 2002...) and, despite trying to overturn the ruling since, it still stands. One up for the composers! Hoorah! "The Blue-Winged Kookaburra is more colourful than the Laughing Kookaburra but has rather unpleasant, staring white eyes. Calls described as maniacal, demonic." Staring white eyes. Maniacal, demonic. Sounds terrifying. Unfortunately Blue Winged Kookaburras only live in the northern reaches of Australia so we are unlikely to ever see the Laughing Kookaburra's deranged cousin, the Bette Davis of kookaburras...which is a great shame. 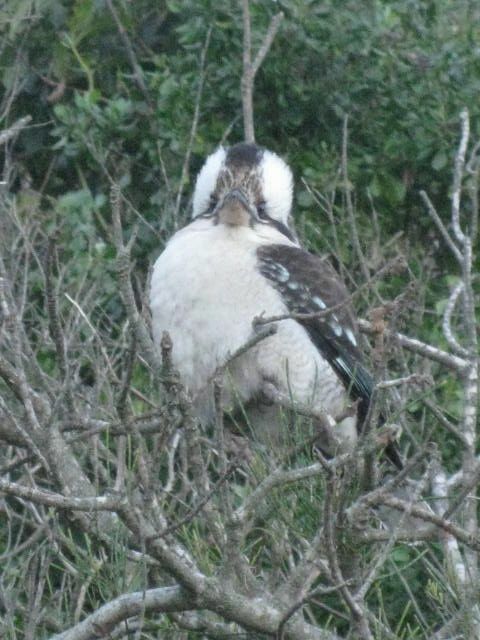 I have never in my life heard or seen a kooka burra. But your post and such a cute poem made me search google right away about a kooka burra and the laughing sound it makes. Such a wonderful laugh they have.